In the abstract of their article on these fossils in Nature, Vinther, Van Roy and Briggs wrote that, "Machaeridians, which are virtually ubiquitous as shell plates in benthic marine shelly assemblages ranging from Early Ordovician (Late Tremadoc) to Carboniferous ... comprise three distinct families of worm-like animals, united by the possession of a dorsal skeleton of calcite plates that is rarely found articulated. Since they were first described 150 years ago machaeridians have been allied with barnacles, echinoderms, molluscs or annelids. Here we describe a new machaeridian with preserved soft parts, including parapodia and chaetae, from the Upper Tremadoc of Morocco, demonstrating the annelid affinity of the group. This discovery shows that a lineage of annelids evolved a dorsal skeleton of calcareous plates early in their history; it also resolves the affinities of a group of problematic Palaeozoic invertebrates previously known only from isolated elements and occasional skeletal assemblages." 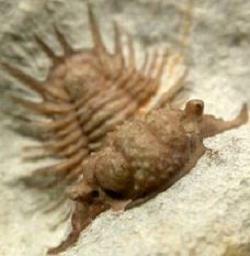 Nature 451, 185-188 (10 January 2008), 'Machaeridians are Palaeozoic armoured annelids.' Another great source is at Christopher Taylor's Catalogue of Organisms. And a third is a paper on the machaeridians of the Hunsruck Slate. Högström and Taylor described Lepidocoleus sarlei Clarke, 1896 from Rochester Shale (Silurian, Wenlock) deposits of New York. Additional specimens of this worm continue to be found at Black Cat Mountain. The following collage shows a few of these. 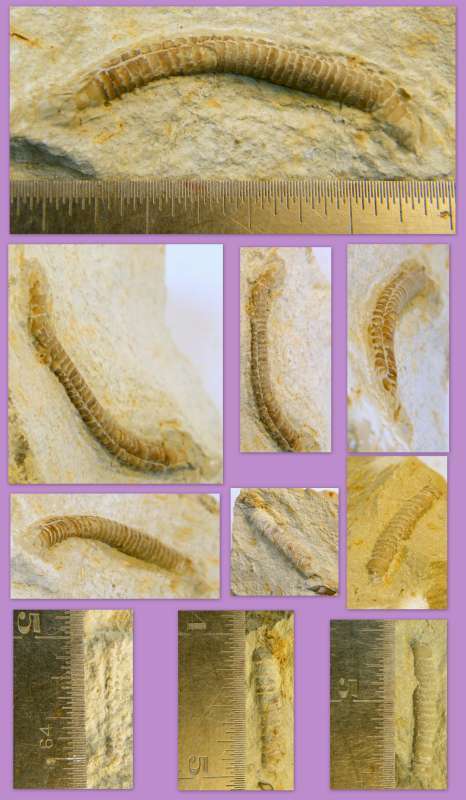 The top four images are different views of the same specimen. Below these are several other specimens in various stages of excavation and exposure.